It is no accident that more television glass is conveyed on our Conveyor Belting than all other types of material combined. If superior belt performance, excellent cut resistance, durability and unmatched wear life is your goal - accept no substitutes. Every Tuff Temp belt is pre-stretched prior to shipment and is available cut to length, pre-laced and with our patented protective lacing cover. consistently proven to offer unmatched wear life and durability. 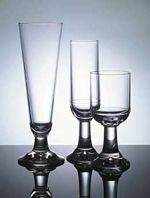 Being completely non-marking on your glass and resisting deformation even under the heaviest glass are just a few of our advantages. Our TUFFNIT Seamless Tube Roller Cover has been design and engineered especially for the most demanding automotive glass bending plants and is used by more manufacturing locations than any other heat resistant roller cover material. Consumerware / Tableware, Ovenware, Opticalware, Prisms, Meter Covers, etc.). Tuff Temp Conveyor Belts are a excellent cost effective replacement for traditional chain / metal belts which require costly and polluting gas burners to prevent checks and marks. No burners are required when running Tuff Temp belts, significantly reducing your energy costs, while improving the surface quality of your ware and drastically improving the air quality of your plants. Jars, Baby Food Jars, etc.). and Lehr Loaders) Tuff Temp products have been specially engineered for your industry. Products such as our Seamless Tubing (available in many different ID sizes) are used the world over as tong covers. Please feel free to contact NOKTA METAL LTD to discuss your particular hot end application. It is our pleasure to provide you with samples of our belting to test in your plant so that we can prove our value, and help you improve the productivity of your manufacturing process. 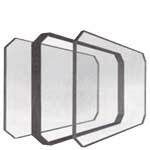 Please use the Navigation Button on the left for additional information on each of our products that were designed, engineered and manufactured especially for the glass making industry.